May he find joy and fulfillment real soon. 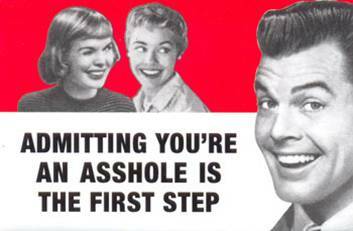 Incidentally, I've been wondering what President Obama thinks of the hysterical tone displayed by some of his supporters in the media, so let's ask him. Mr. President, how about it? What do you have to say about the ridiculous antics of people like Chris Matthews? 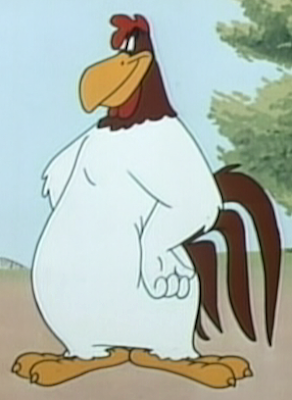 Excuse me, sir, I said what do you have to say about Chris Matthews? Well, there you have it, folks, straight from the horse's mouth (depending on your perspective). Who’s up for some Bill Haley? Rubio was charismatic tonight; I think he may well be president someday. Eastwood looked surprisingly...old. He rambled quite a bit, but he got in a couple of good shots at B.O. Romney touched all the bases. As good a speech as he's delivered yet, I'd imagine. 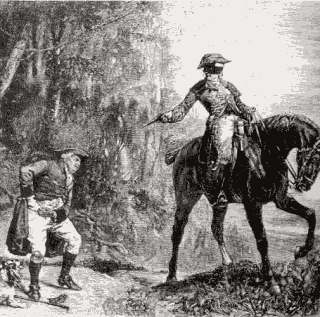 Had General Washington, after his victory at Yorktown, not only declined to accept General Cornwallis’ sword, but struck his colors and surrendered his own to that baffled gentleman, I daresay that I should find the episode little more unfathomable than the surrender in our own era by the free press to the pretensions of the levelers and statists who are applying themselves so diligently to the task of digging a grave for our hereditary liberties. Where is the zealous spirit of inquiry that hath marked the fourth estate of yore, the determination, the independence – ay, even the contumacy - in the face of shady and self-serving officialdom? When did the truth-seekers throw over their role as the proverbial canary in the coal mine, and league themselves with the very Miasma emanating from the pit of oligarchy that has become our government? And do not deceive yourselves, ladies and gentlemen of the press, into believing that the First Amendment will somehow be able to thrust its nose from under the pillow with which the present régime is attempting to suffocate our other constitutional rights. 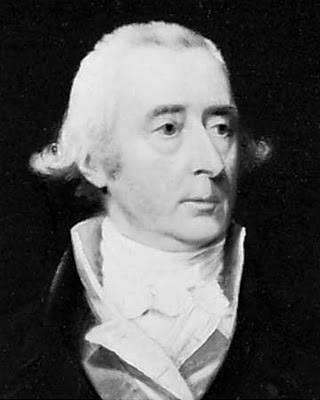 A government that does not shrink from arrogating unto itself the office of shepherd to a flock of three hundred millions of sheep is not likely to balk at taking measures to ensure that its charges are not unduly confused or unsettled by strange and unharmonious voices, or beguiled by tunes not previously approved by those in authority. Yet, sadly, to all appearances, having abdicated your responsibilities, you do not seem overmuch concerned at relinquishing even your own independence; rather, you are only too happy to serve as tyranny’s walking stick, and numerous members of your profession compete for the honor of Grand Marshall in this parade along what a keen observer once called the “road to serfdom”. That this parade includes in its train an abundance of clowns in no way alters the grim and barren landscape of its ultimate destination, or exculpates the putatively serious-minded among you from charges of betraying both your calling and your country. What a mercy it is that John Peter Zenger has been dead, lo, these many years. Were he alive today, and grappling with the same encroachments upon liberty by the petty tyrants of our epoch that incensed his devotion to freedom in his own time, I doubt not but that his nominal confreres would, instead of standing by his side, be bawling for his condemnation. Like unto Esau, you have sold your birthright for a mess of pottage. Perhaps that will be a sufficiency to you – in which case, more’s the shame that is your due. I am not only greatly impressed by Paul Ryan, but by the political shrewdness that Mitt Romney displayed in choosing him as his Vice Presidential candidate (in defiance of the handwringers in the GOP establishment). Ryan’s speech was a tour de force, and the underlying worldview, in which the extent of individual freedom in human action, and the accountability of the state to the citizen, constitute the primary litmus test for the good society - a worldview which Ryan expressed simply, but with sincere passion – positively towers over the Democrats’ stale mish-mash of socialist dogma, worn-out tax-and-spend strategies, internationalist masochism, and special-interest pandering, especially as this leftist litany continues to be yawped by an increasingly angry and neurotic mob of administration surrogates who are utterly bereft of new ideas and a defensible record. Here is Ryan’s complete speech (which absolutely bowled Ace over). So why would anybody give a microphone to Chris Matthews? The media’s bias is now way beyond shameless, of course, which Republicans need to bear in mind during this and future elections. The GOP is fighting a two-front war – one against the official Democratic Party apparatus, one against its auxiliaries in the legacy media. Strategy and tactics must change, accordingly. Screenwriter and political conservative, Robert Avrech, discusses his interview with Stuart Varney on Dinesh D’Sousa’s surprisingly (maybe not so surprisingly) popular anti-Obama documentary. I described the feeling of electricity in the air, the manner in which the audience connected with the film on a deep, emotional level and, of course, the standing ovation at the end of the movie. Stuart asked me whether this wasn’t unusual for a political documentary. I affirmed that it was, especially for a film that has been ignored or treated with scorn by the mainstream media. I mentioned that at some screenings, the audience spontaneously breaks into “G-d Bless America” because Dinesh D’Sousa’s movie is not so much anti-Obama — it’s a deeply nuanced psycho-political portrait — as an affirmation of America’s exceptionalism, a designation President Obama’s policies are designed to erase. Have you ever read a funny article about vacuum cleaners? Which came first, the idiotic spendthrift government bureaucracy or the egg? "An Australian artist has created a rock sculpture in the shape of an egg that resides in a remote section of one of Australia's national parks. But in an even stranger development, the Department of Environment and Resource Management has paid the artist, Andy Goldsworthy, more than $700,000 for the creation, entitled "Strangler Cairn," which in time will essentially disappear once it has been grown over by strangler fig." Sure, as liberal media types will tell you, we’d rather be watching “black people drown” *, but the convention has had some highly worthwhile moments. I saw Ann Romney’s speech, and found her pretty impressive (“Mitt will not fail” – unlike, you know, that other guy). I didn’t catch Artur Davis’ speech, but I read the selections from his text posted at Hot Air; powerful stuff that is almost overwhelming in its sheer reasonableness. I particularly liked this line: “Maybe we should have known that night in Denver that things that begin with plywood Greek columns and artificial smoke typically don’t end well”. And I’m in love with Mia! Amen, brother. As I’ve said before, the mainstream media aren’t just in the tank for Obama; they are the tank. Are you an Iranian male? Having trouble finding a date? Boy, have we got good news for you! Hey, but who am I to project my chauvinistic western mindset on other cultures, right? I mean, I really probably shouldn’t be applauding the Israeli guy in this video either, should I? (H/T to Jill J for the video). Update: Colonel Milquetoast, in the comments - "I'm guessing it is Mohammad Ali Isfenani's plan to build an army of tiny, burka clad Oompa Loompas and style himself as a Persian Willy Wonka." The Republican war on women is phony. Obama's war on the infant survivors of abortion is all too real. Wells Fargo Home Mortgage (WFC) has fired a Des Moines worker over a 1963 incident at a Laundromat involving a fake dime in the wake of new employment guidelines. 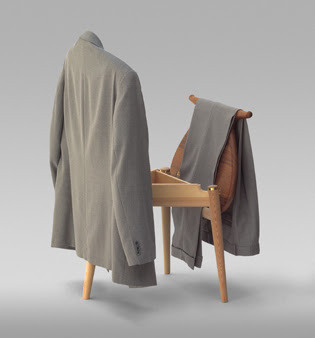 Richard Eggers, 68, was fired in July from his job as a customer service representative for putting a cardboard cutout of a dime in a washing machine nearly 50 years ago in Carlisle, the Des Moines Register reported Monday. Interesting. Democratic kleptarch Barney Frank engineers underwriting changes that caused a real estate collapse, and retires this year with all of his lavish government perks. The infamous Jon Corzine, investment banker and Obama bundler, can't account for hundreds of millions of dollars of missing customer funds, but is cleared of any criminal wrongdoing. This poor putz gets canned for a minor crime committed 50 years ago. I know, life isn't fair. But sometimes it's a hell of a lot more unfair that it has to be. How about Dennis Miller for Romney’s White House spokesman? Jeff Poor over at the Daily Caller has a video of Miller discussing Biden with Jay Leno. For example, the Democrats plan to trot out “warrior” Jim Sinegal, former Costco CEO and co-founder. During his tenure at the retail supply firm, Sinegal faced allegations of widespread gender discrimination at the company, which was the target of a 2006 class-action lawsuit. The plaintiffs in the case alleged that Costco frequently promoted less-qualified male employees to the detriment of female employees, and failed to give sufficient notice of advancement opportunities. Court filings charge that Costco practices allowed for “favoritism and individual biases” in the awarding of promotions. The company disregarded complaints of such discrimination, and Sinegal personally opposed recommendations to provide advanced notice of senior management opportunities, the suit alleged. And of course, Bill “Better Put Some Ice on That” Clinton will be there. Portrayal of women as giant guava fruits vaginas: good. Chomsky is immensely important to the radical left. When it comes to American foreign policy he isn’t just influential, he’s basically all they have. Almost any argument made about foreign affairs by the radical left can be traced back to him. The giant government cookie jar is just about empty. The state boasts a population of more than 37 million. However, the Orange County Register reports that 870,550 people left the state between 2005 and 2009. “That’s like the whole city of San Francisco just up and left,” the article states. What is chasing people away? It might have something to do with the state having the third highest unemployment rate in the nation at 10.7 percent and the $500 billion of unfunded liabilities of its pension systems and a roughly $16 billion deficit. The state, with one-ninth of the U.S. population, is also home to 34 percent of the welfare recipients in the country. If that’s not enough, California’s top-down tax structure deters businesses from opening or expanding, and the environmental movement is in full swing in the state, even preventing the agriculturally rich Central Valley from receiving its full water allocation. Eric Holder, the Worst Attorney General in U.S. History, has apparently found an excuse: “DOJ Seeks Candidates With ‘Psychiatric’ and ‘Severe Intellectual’ Disabilities”. It’s official. The Obama administration is intent on dumbing down the Justice Department. Literally. Nice try, Eric, but I still don’t think you’re going to get away with Fast and Furious by pretending it was a psychotic episode covered by an executive order pertaining to employees with intellectual disabilities. While Obama can’t be bothered with the needs of his own blood relations, Mitt Romney has distinguished himself through acts of kindness and generosity toward friends, employees and even complete strangers. 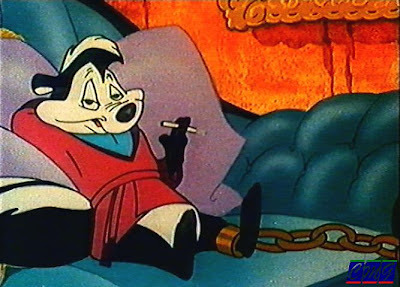 American Power has an excellent post up which shows us the genuine charity of the real man – a refreshing change of pace from his depiction by Demo-Bolsheviks as a cartoon capitalist. “Food shortages could force world into vegetarianism, warn scientists”. It never ceases to amaze me how the free press has turned itself into one of the most assiduous gravediggers of American liberty. 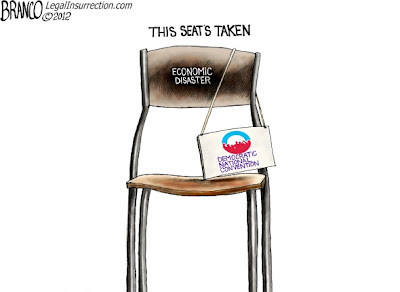 An avalanche of costly new regulations. Americans are learning more about the "fiscal cliff" approaching at the beginning of next year, when tax rates for families and small businesses are set to spike and new taxes in President Obama's health-care spending law take effect. But unless there's real change in Washington, we're also headed for a steep "regulatory cliff" that could compound the damage. After three years of bureaucratic excess, the Obama administration has been quietly postponing several multibillion-dollar regulations until after the November election. Those delayed rules, together with more than 130 unfinished mandates under the 2010 Dodd-Frank financial law, could significantly increase the regulatory drag on our economy in 2013. Give your dog a pat on the head from Paco. "It says right here, 'early dog flourished on a diet of pork chops and pound cake.' I say, hoorah for the good old days!" Sylvester Stallone's mom can tell your future by reading...well, not your palm, exactly. Rodney Dangerfield leaves ‘em laughin’. The first man to walk on the moon has died. I can only imagine the kind of courage that it must have taken for Armstrong and his comrades to make that tremendous, unprecedented journey. I pray that America will always be able to generate such heroes. 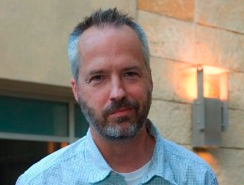 Craig Karpel is a recovering addict. He says so himself. His addiction is to Barack Obama, and his recovery inspires him to write a book. He offers a 12-step program, patterned after the program that has rescued thousands of town drunks. American Digest ponders some radical changes in highway signs. A longish selection of video clips of Tommy Dorsey (including a version of his classic, “TD’s Boogie Woogie”), Ray Anthony, Benny Carter and others. 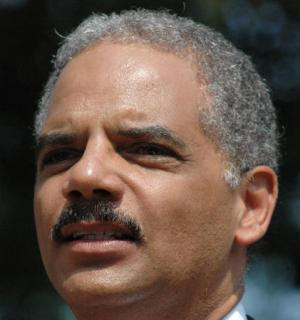 What, is Eric Holder seeking asylum? The Worst Attorney General in History is spending an awful lot of time offshore these days . Up to now, it looked like Secretary of State Hillary Clinton was racing former SecState Condi Rice in a quest to rack up the most frequent-flier miles. But it seems Clinton might have competition from an unlikely source: Attorney General Eric Holder, who has been quite the jet-setter of late. We hear he’s planning a trip next month to Saudi Arabia and other Middle Eastern countries. That intercontinental jaunt will cap off a summer that has included visits by the AG to Denmark, Germany, Guam, Malaysia and Singapore. Just after a House subcommittee approved an effort to hold Holder in contempt of Congress for refusing to turn over documents relating to the “Fast and Furious” controversy, the nation’s top lawyer boarded a plane bound for Copenhagen. The two-day trip also included a stop in Berlin. Last month, he made a nine-day sweep that included Hono¬lulu, Guam, Kuala Lumpur and Singapore. Exelon’s top executives were early and frequent supporters of Mr. Obama as he rose from the Illinois State Senate to the White House. John W. Rogers Jr., a friend of the president’s and one of his top fund-raisers, is an Exelon board member. David Axelrod, Mr. Obama’s longtime political strategist, once worked as an Exelon consultant, and Rahm Emanuel, the Chicago mayor and Mr. Obama’s former chief of staff, helped create the company through a corporate merger in 2000 while working as an investment banker. With energy an increasingly pivotal issue for the Obama White House, a review of Exelon’s relationship with the administration shows how familiarity has helped foster access at the upper reaches of government and how, in some cases, the outcome has been favorable for Exelon. White House records show that Exelon executives were able to secure an unusually large number of meetings with top administration officials at key moments in the consideration of environmental regulations that have been drafted in a way that hurt Exelon’s competitors, but curb the high cost of compliance for Exelon and its industry allies. In addition, Exelon, which provides power to more than 6.6 million customers in at least 16 states and the District of Columbia, was chosen as one of only six electric utilities nationwide for the maximum $200 million stimulus grant from the Energy Department. “Get to the polls on November 2” (and if that doesn’t work out, drop back in around November 7th). ...everybody ought to have a hobby. An astoundingly dishonest book, superbly skewered. ...or had chased interns, or had ignored his gay boyfriend running a prostitution ring out of his apartment, or had been impeached and deposed as a judge, then maybe he'd still be a viable candidate for office. Oh, I almost forgot...and if only he had been a Democrat. Is our southern border getting safer? Or are we just defining "safe" down? Bryan Preston at PJ Media discusses the issue in a fascinating investigative series ( Part I and Part II. Believe it or not, in China white guys can get a job posing as businessmen for companies who hire them to look more international to their real partners. It’s called “White Guy Window Dressing” and it’s apparently a very popular business tactic. You need to be careful, though. "Hi, I'm a corporate executive, but - let me make this clear - I'M DEFINITELY NOT IN CHARGE"
And it stinks to high heaven. ObamaCare includes 18 - Count 'em! 18 - new taxes. 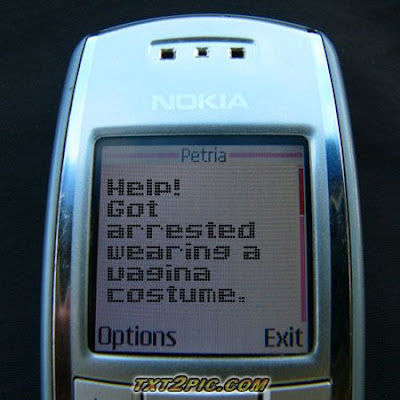 I mean, you never know when you might need one. Despite having no horses, the water and sewerage department for the city of Detroit employs a horseshoer. ...and take a trip through a liberal brain. Sam Elliot offers a momentary truce in the fine western, Conagher. Republican VP candidate Paul Ryan is drawing huge crowds, most recently in Florida, as recorded by Deep Fried Manatees in this post. I like to see the Republicans on offense - what a refreshing change of pace! - and am particularly pleased (and pleasantly surprised) that Romney and Ryan have so quickly managed to turn the Democrats' Mediscare strategy against them. 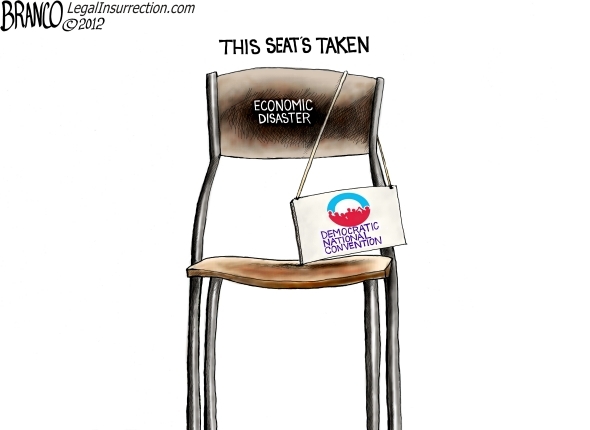 Meanwhile, the Obama campaign is, er, "purposely" shooting for small crowds. One reason given for Obama's small crowds - which are no accident, mind you, all part of the plan - is to "allow the president to better connect with supporters". You mean, like this? Doctor of Theology, Frank J, explains Christianity (H/T: Captain Heinrichs). Jack Benny, Mel Blanc and Don Wilson clown around. Say, why doesn't Obama just make Valerie Jarrett Vice President? Although I suppose that would be a demotion for her. 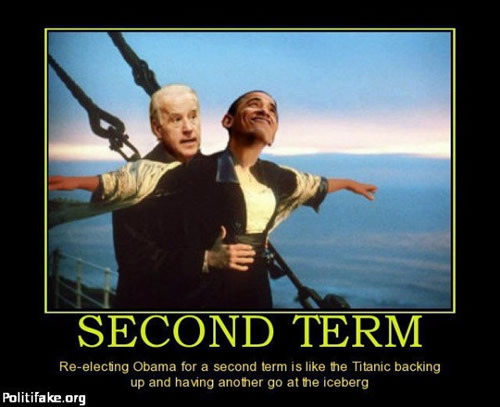 Kind of like the ventriloquist changing places with the dummy. No one outside Michelle has the access or power over Obama's decision-making like Jarrett does. Here's an odd little fact that gives some insight into what kind of president Obama is: Michelle, Michelle's mother, and Valerie, and only a few others in Washington, are allowed to call Barack by his first name. After work, Jarrett joins Obama at night in the Family Quarters, where she dines often with the First Family. She goes on vacation with them. Jarrett's title is the weird mouthful "Assistant to the President for Public Engagement and Intergovernmental Affairs." She is the gatekeeper, but she is also much more than that. She occupies Karl Rove's and Hillary's old office and has an all-access pass to meetings. She shows up at the National Security Council, at meetings on the economy and budget. She stays behind to advise Obama on what to think and do. Obama uses her as his left-wing conscience. Klein's sources describe how at each pressing issue, Obama turns to ask her, "What do you think the right thing to do is?" As president, he likes to have her next to him "as the voice of authentic blackness in a White House that is staffed largely by whites." Those frantic fund-raising emails are getting shriller. "I'll give you hope, but I want your change!" So-called "Fact Sheets" have replaced traditional background reports, and they include a heaping helping of self-serving Obamaganda. He'll be erecting statues of himself in our major cities soon. They've found him an auxiliary brain (bound to be better than the factory original). Update: Uh oh. 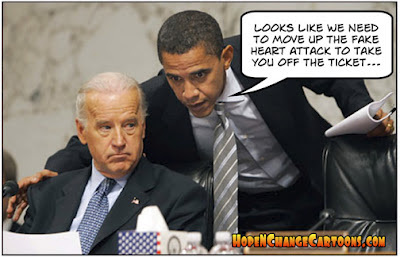 Isophorone spills the beans: Joe Biden has been poisoned by Republicans. Eric "Mad Dog" Boehlert, a special ops martial arts expert left-wing hack employed by Media Matters, accuses the Navy SEALS who have gone public with their criticisms of the Obama administration's security leaks of being gutless. 1) Once spotted a penny on the sidewalk and stopped to pick it up, flouting the sneers of his well-heeled friends. 2) Removed the tag that says "Do Not Remove" from his mattress. 3) Doesn't yield to the guy on his right at four-way stop-signs. 4) Ate just one potato chip. 5) Bought a quart of milk one whole day after the "sell-by" date. 6) Took his teacup poodle, Genghis Khan, to the park one day and didn't pick up his poop. 7) Had lunch with David Brooks and savagely used all the butter pats on a slice of rye bread, leaving David to gnaw on a dry piece of Melba toast. 8) Didn't recycle an empty bottle of Slim-Fast. 9) Sneaked into the men's room at Chick-Fil-A, wearing dark glasses, a wig and an Assyrian beard, and wrote the word "Haters!" on the wall (in pencil). 10) Goes swimming 55 minutes after eating. "You want your Gadsden flag back? Then get out of that wheel chair and take it!" ...make sure you create a mountain of paperwork. Rita Hayworth, lookin’ gorgeous in green! Dang, she looks pretty good in yellow, too! This story is both deliciously ironic and gag-inducing. White House spokesturd Jay Carney said today that Biden is staying on the ticket – but couldn’t make his point without taking a swipe at Sarah Palin. 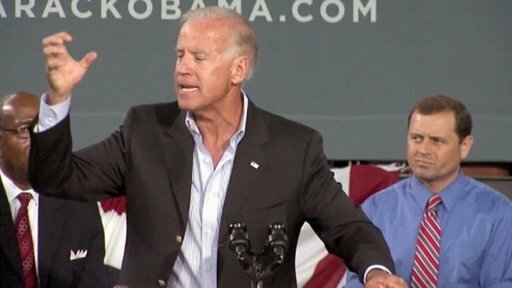 Elsewhere, Joe Biden’s mouth – which is like a semi with no brakes hurtling down a steep grade on I-81 – uttered the following words: “I guarantee you, flat guarantee you, there will be no changes in Social Security.” I take this as confirmation that the Obama administration is committed to the bankruptcy of the program. Good video clip at Hyscience on the strategy of divisiveness being employed by the Democrats. Selective media outrage: the same old same old. Is Obama an advocate of Mutually Assured Destruction? Mr. Bingley utterly beats me to the punch on this analogy involving swindler/bundler Jon Corzine. “All good things in Nigeria are done by Muslims”. Oh, you mean like slaughtering Christians? Another true sign of the end times for California. Apparently, Jesus wouldn’t agree with Paul Ryan’s tax policy. HAW! "Joe Biden's Minstrel Show"
"Hand me down my banjo, Mr. Interlocutor, and I'll give ya'll a few verses of 'Shortnin' Bread'". But, c'mon, man, don't be a dumbass. But now we’ve got to worry about Russian submarines in the neighborhood? Proving to the world that they are still a major military player, allegedly a Russian submarine quietly patrolled the Gulf of Mexico unnoticed by the U.S. military. The stealthy nuclear–powered sub, armed with cruise missiles quietly traversed U.S. waters for weeks highlighting a potential flaw in America’s security. A friend of mine, who has contacts in Russia, tells me he's hearing that the Obama administration may well have known about the sub, but didn’t want to draw attention to its presence because it would have been a political embarrassment. 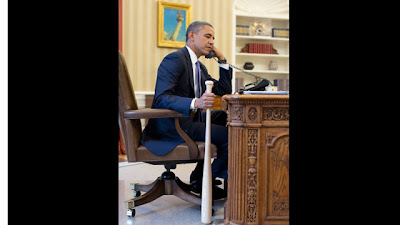 Maybe this might also get people to wondering just how “flexible” Obama plans to be in his dealings with Putin. Ted Yoho, a Tea Party candidate in Florida’s 3rd Congressional district, appears to have narrowly edged out a long-time incumbent in the Republican primary. Check out one of his ads (a graphic portrayal of politicians at the trough). How do I know? Because he thinks Paul Ryan is a bigger threat to America than the Muslim Brotherhood. Update: And Obama's at least as divisive as he is dumb. Civility quotient: Are you kidding? Update: Suuuuure they are: "Team Obama confident Biden can take on Ryan". "They gonna put ya'll back in chains! Paul Ryan don't know nuthin' 'bout birthin' no babies! Can I get an amen?" 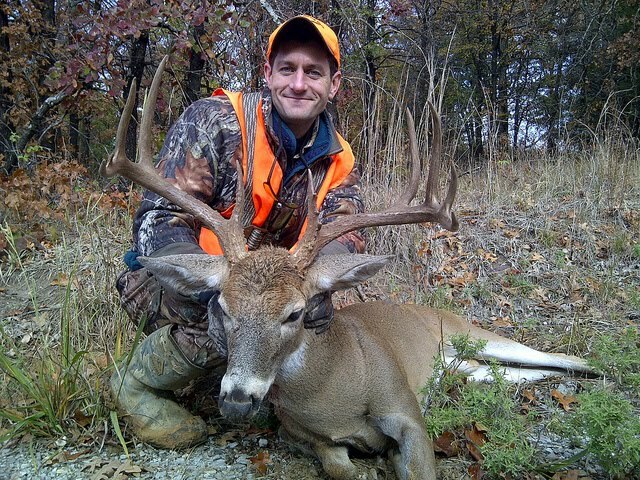 Paul Ryan, destroyer of Democrat worlds (H/T: Captain Heinrichs). Before there was a Scotland Yard, London had its night watchmen, mounted patrols and the famous Bow Street runners. 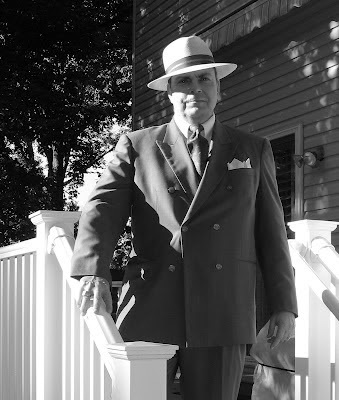 Ian Dennis and S. Thomas Russell – under the pen name T.F. Banks – created a memorable fictional runner in the person of Henry Morton, the hero of the two novels that Dennis and Russell published together in 2001 (The Thief Taker) and 2003 (The Emperor’s Assassin). Unfortunately, there are only two books in what I imagine was probably originally envisioned as a longer series (I’m not sure why there are only two, although I do know that Russell went on eventually to create a first-rate series of novels set in the age of fighting sail - the first of which I reviewed here). In The Thief Taker, we are introduced to Henry Morton, a man of integrity and intelligence who is committed to fighting crime – unlike some of his colleagues, one of whom (George Vaughan) is deeply enmeshed in the shadier side of thief-taking (e,g., entrapping the dimmer sort of housebreakers by tipping them off to promising targets, then arranging to have them arrested). The initial crime that sets the plot in motion is the arrival of a young nobleman at a party in a coach. The passenger is quite dead, and although a doctor declares that the man has died from choking on his own vomit as a result of an excess of drink, Morton, who is called to the scene, picks up various clues that the doctor has missed, and concludes that the victim has been poisoned. His investigation, in which he is occasionally assisted by his mistress, the beautiful actress, Arabella Malibrant, leads him into the seamiest parts of London, and opens up inquiries into a network of criminal enterprises which includes, among its most heinous assets, a brothel in which the services are provided by female children. As Morton, who has also been tasked with recovering some stolen Elgin marble figures, begins to narrow down the suspects in the murder case, he, himself, winds up as the subject of an investigation, when some of the missing artwork turns up in his own flat – where he is arrested by none other than the unscrupulous Vaughan. Faced now with the prospect of being tried for his life for a theft he didn’t commit, Morton, with the help of a young constable, escapes and returns to the brothel, where, with the help of a particularly precocious young girl, he assembles evidence and arranges for testimony that will determine whether he breaks the criminal syndicate or swings on a false charge. The book is filled with rich period detail and a host of interesting characters, and brings to life many of the prominent features of the precarious system of justice that existed before the modernization of law enforcement in England. A superb combination of mystery and historical fiction, The Thief Taker is highly recommended. For too long, politicians of both parties have ducked our country’s ominous entitlements problems and have struggled to make incremental gains in position that have resulted in small, and sometimes only temporary, victories on peripheral issues by one or the other party, but have caused the nation to become completely bogged down in resolving the larger conflict of which entitlements represent a key component – to wit, the free society vs. the provider state. In choosing Paul Ryan as his running mate, Mitt Romney has paid the American people the supreme compliment of assuming that they are ready for a serious national conversation on some of the most serious threats to our political and economic freedom that we have faced in our history: run-away government spending, crushing deficits, the regulatory stranglehold of government on free enterprise, and the likely collapse of the social safety net in the absence of legitimate reform. Whether the compliment is deserved, or whether many of us will wake up the day after the election to find out that we have been involuntarily enrolled in a national suicide pact, remains to be seen. But the line in the sand has been drawn, and I prefer to know sooner rather than later what kind of country we have become. Are we a nation whose citizenry is capable of making intelligent choices based on logic, genuine fairness and a veneration for our hereditary liberty, or are we just a heterogeneous mix of parlor radicals, self-perceived sans-culottes, and tractable sheep, wallowing in ignorance and envy, ruled by base emotions, and bawling for the heads of our mythical “oppressors”? Stay tuned. Jack Benny – an angel who has been sent to earth to sound the last trump – gets seriously sidetracked in the 1945 comedy/fantasy, The Horn Blows at Midnight. UPDATE: By the way, I'd be extremely grateful to anyone who could identify the opening tune of this video. It's hot, but has almost a wistful quality to it; in any event, it appeals to me strongly(or, rather, "it sends me, Jackson!") Perhaps it was just incidental music composed for the movie, but it sounds to me more like some kind of actual pop tune from the period. And if that doesn't work, I guess he goes back to Plan A. By the way, who's up for a debate between Paul Ryan and...heh...Joe Biden? 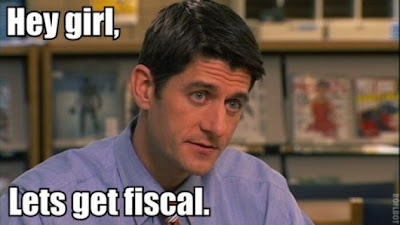 From the Paul Ryan "Hey girl" meme. I wish Amazon would screw up one of my orders like this. Harry Reid reveals his source! Obama? McKayla is not impressed. 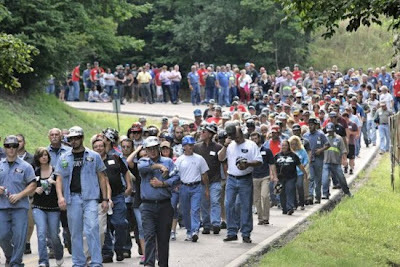 "Somebody at Oscar Mayer told me that when Paul Ryan was working for the company as a salesman during college, he ran over a disabled veteran while driving the Wienermobile"
Update: Romney and Ryan speak to huge, enthusiastic crowds in Manassas, Virginia. Rep. Paul Ryan was my choice for president, but VP will do. 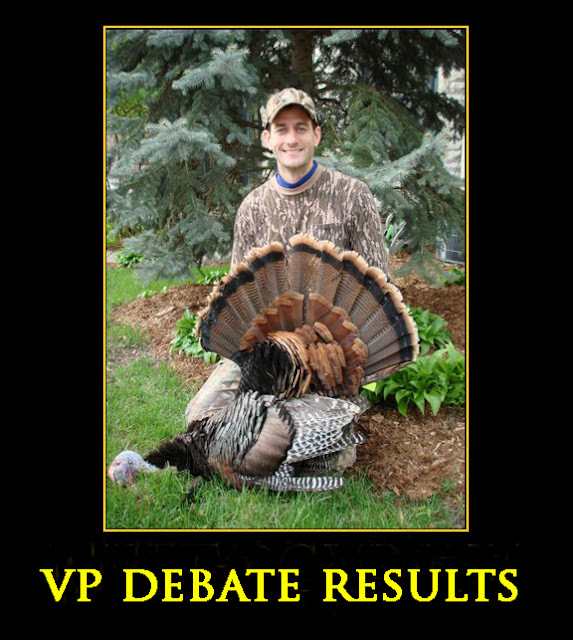 Will there be a VP debate this year? Ryan vs. Biden? If so, it should be...memorable. The downside, of course, will be the ominous increase in the power of Ryan's fellow Wisconsinites, Steve and Lance Burri. We shall have to be on our guard against crony blogging. A taste of things to come: Paul Ryan disposes of the ObamaCare b.s. in six minutes. Update: The hashtag that changed history? Update II: Iowahawk makes an important observation: "Paul Ryan represents Obama's most horrifying nightmare: math." Update IV: Ryan is strong on Second Amendment rights, too (H/T: Marica). That'll look good mounted next to Harry Reid's prune puss. Update V: A dynamite ad that Paul Ryan made previously (H/T: Legal Insurrection). Update VI: David Axelrod responds. Update VII: Is there anything Paul Ryan can't do? "Paul Ryan loves catfish noodling". And so the Departments of Education and Justice have launched a campaign against disproportionate minority discipline rates, which show up in virtually every school district with significant numbers of black and Hispanic students. The possibility that students’ behavior, not educators’ racism, drives those rates lies outside the Obama administration’s conceptual universe. But the country will pay a high price for the feds’ blindness, as the cascade of red tape and lawsuits emanating from Washington will depress student achievement and enrich advocates and attorneys for years to come. The feds have reached their conclusions, however, without answering the obvious question: Are black students suspended more often because they misbehave more? Arne Duncan, of all people, should be aware of inner-city students’ self-discipline problems, having headed the Chicago school system before becoming secretary of education. Chicago’s minority youth murder one another with abandon. Since 2008, more than 530 people under the age of 21 have been killed in the city, mostly by their peers, according to the Chicago Reporter; virtually all the perpetrators were black or Hispanic. In 2009, the widely publicized beating death of 16-year-old Derrion Albert by his fellow students sent Duncan hurrying back to the Windy City, accompanied by Attorney General Eric Holder, to try to contain the fallout in advance of Chicago’s bid for the 2016 Olympics (see “Chicago’s Real Crime Story,” Winter 2010). Between September 2011 and February 2012, 25 times more black Chicago students than white ones were arrested at school, mostly for battery; black students outnumbered whites by four to one. (In response to the inevitable outcry over the arrest data, a Chicago teacher commented: “I feel bad for kids being arrested, . . . but I feel worse seeing a kid get his head smashed on the floor and almost die. Or a teacher being threatened with his life.”) So when Duncan lamented, upon the release of the 2012 discipline report, that “some of the worst [discipline] discrepancies are in my hometown of Chicago,” one could only ask: What does he expect? Yep, looks like the The Western Mail is going to be needing a new obituaries editor. A Chinese man can slice fruit and vegetables by throwing playing cards at them. Hey, everybody needs a hobby, right? Looks like Al Franken - former comedian turned U.S. senator - may have been the beneficiary of fraudulent votes (as in, he probably wouldn't have won without them). Let's face it: if voter fraud were truly a negligible phenomenon, Attorney General Eric Holder wouldn't be opposing efforts to stop it. Nancy Pelosi claims that the ghosts of several women's rights activists apparently tried to climb into her lap at a meeting in the White House. 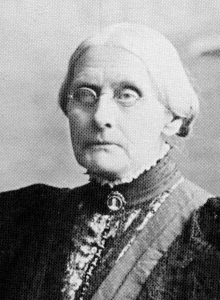 Susan B. Anthony, who could not be reached for comment, was supposedly one of them. Since Anthony was a Republican, maybe she was trying to shove Pelosi onto the floor, preparatory to stomping on her with her high-button shoes. "Damn! If I'd have known we were going to wind up with Nancy Pelosi, I'd have just stayed home and baked cookies!" The socialist government in France is increasing taxes on the "rich" to a rate of 75%. I contacted a well-to-do Frenchman of my acquaintance and asked him what he thought of this proposal. "C'est absurde! Theez socialeests are no better than, how do you say, pock pickets!" 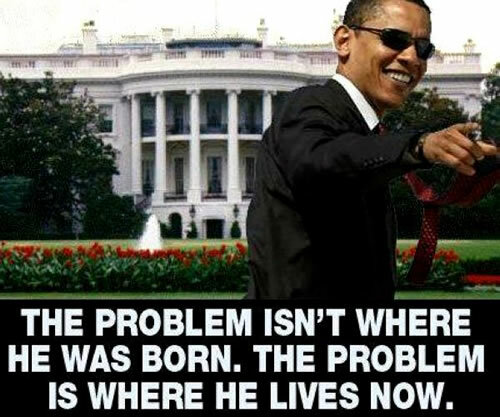 Obama claims that Romney will take us back to the 1950s. 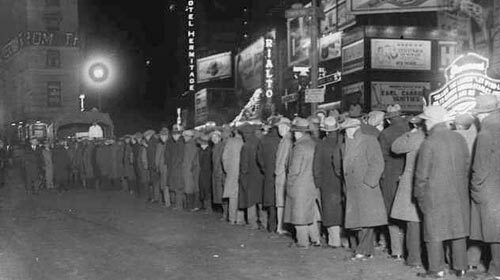 Obama, meanwhile, is intent on taking us back to an even earlier time. "Hey, Mr. President, we hope you can spare some change!" No, really, this should be amusing: “Jimmy Carter to address the Democratic National Convention”. Or, as DrewM puts it in his post headline at Ace of Spades, “A Touching Moment At This Year's Democratic Convention: Jimmy Carter Will Pass The Torch Of Worst Post WWII President To Barack Obama”. On the Republican side, I am delighted to see that Rand Paul has been invited to speak at the GOP convention, and am eager to hear his speech. He strikes me as someone who’s completely unafraid of the liberal ideological juggernaut, and the miasma of political correctness that emanates from it. "President Obama has not taken a serious question from the White House press corps in nearly seven weeks, a remarkable string that points to a campaign-style White House operation that is seeking to insulate the candidate from tough cross examination." ...told me Obama attended as a foreign exchange student. Am I certain this is true? Well, no, but only Barry can prove that it isn't - by releasing his college records. On another topic..."Romney Hood"?...Dude, seriously? Are all of those Hollywood types who are supporting you actors and directors? No comedy writers at all? Liberal fascism: the new normal? Yuval Levin, at NRO, has written a sharply-focused, highly perceptive piece on Obama’s views concerning the proper relationship between the citizen and the state. 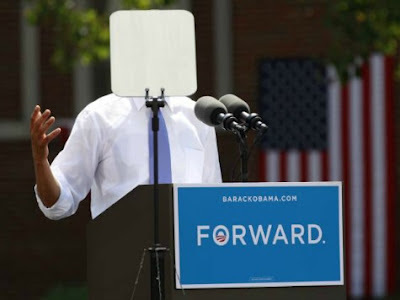 In a nutshell, when Obama said he wanted to be a “transformative” president, he wasn’t kidding. Again and again, the administration has sought to hollow out the space between the individual and the state. Its approach to the private economy has involved pursuing consolidation in key industries — privileging a few major players that are to be treated essentially as public utilities, while locking out competition from smaller or newer firms. This both ensures the cooperation of the large players and makes the economy more manageable and orderly. And it leaves no one pursuing ends that are not the government’s ends. This has been the essence of the administration’s policies toward automakers, health insurers, banks, hospitals, and many others. It is an attitude that takes the wealth-creation capacity of our economy for granted, treats the chaotic churning and endless combat of competing firms (which in fact is the source of that capacity) as a dangerous distraction from essential public goals, and considers the business world to be parasitic on society — benefiting from the infrastructure and resources provided by the genuine common action of the state. Of course, the state’s benevolence is made possible precisely by the nation’s wealthiest citizens, but the president seems to see that as simply an appropriate degree of “giving something back.” His words and his administration’s actions imply that he views the government as the only genuine tribune of public desires, and therefore seeks to harness the private economy to the purposes and goals of those in power [my emphasis – Paco]. There is, in all of this, a chilling echo of a worldview which we like to delude ourselves into thinking perished many decades ago: All within the state, nothing outside the state, nothing against the state. Obama: "The private sector is doing fine"
If, by "fine", you mean up s**t creek in a leaky canoe. Oh, and here's another reminder that applies to me as much as to anyone else: Harry Reid is not running for president. I'm thinking that his big lie represented an attack on Romney that was coordinated with the Obama campaign as yet another smoke bomb to keep people from focusing on the preshizzle's spectacularly bad record. So I'm done with Reid - for now. Tom Selleck takes on Alan Rickman in Quigley Down Under. Thinking of going to the beach at Sherwood Island, tomorrow? Fugeddaboudit! Never mind the (probably) fake pederasty accusations. Harry Reid has plenty of real skeletons in his closet. Pixie Place raises an issue that, in reality, goes to the heart of our culture's will to survive as a free society: "When did the I-don’t-have-the-patience-to-deal-with-my-own-children thinking become the norm?" Australians continue to push the envelope on, er, scientific experimentation. Steve at the Pub takes umbrage at the attitude of American customs personnel (and hoteliers). Rinardman swoons over the new, Obama-era Corvette. Many people seem to be having trouble with arithmetic these days, but whether it's 4 metres or 40, the spectacle of London mayor Boris Johnson dangling from a wire was most refreshing. Liberty at Stake opines on chicken sandwiches and the pursuit of happiness. 36 chambers discovers one of those elusive "shovel-ready jobs". The political smear as an art form. (H/T: Captain Heinrichs). Looks like Steve Burri and his clan are about to become a single-family motorcycle gang. 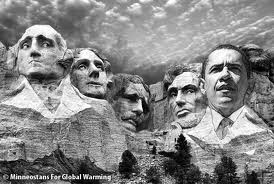 Is Obama the most commercialized U.S. president ever? Well, yes, I'd say that's now pretty much indisputable. Frankly, I'm not sure how we ever managed to get along without brainwave-controlled cat ears. Pundit and Pundette showcase an unbelievably stupid MoveOn video featuring Ann Romney's horse, Ralfalca. It's another attempt to demonstrate that Mitt Romney is Thurston Howell III, and, thus, out of touch with regular Americans. Clint Eastwood endorses Mitt Romney. Update: Roger Simon provides some Hollywood context. In recent years, Hollywood conservatives have been as deep in the closet as 1950s gays. But Barack Obama, the man of hope and change, has changed that. The times are so terrible that more and more entertainment industry conservatives are coming out and risking irritating their fuddy-duddy liberal peers, maybe even losing a job or two into the bargain. “The fact is we’ve been very clear. President Obama has said it in his campaign and since then and in this campaign as well. The Democrats want to be — have fairness in our tax code; that we want to go forward with giving — having the tax cuts for those making over $250,000, a couple making over $250,000, to have those tax cuts expire,” said Pelosi on Thursday at the Capitol. 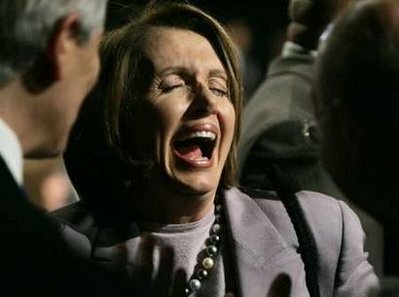 Demented much, Nancy? Or did your larynx just come uncoupled from your...brain, to use a figure of speech? Open pit mining for stupid. One of boogie-woogie’s original Big Three, Meade Luxe Lewis, flies over the ivories with this finger-bustin’ eight-to-the-bar. Vante CFO, Adam Smith - the guy who notoriously berated a Chick-Fil-A employee at a drive-through - has been fired. Heh. Liberal politics just keep on boosting unemployment. "Boy's about, I say, boy's about as subtle as a hand grenade in a barrel of oatmeal." Related: Obama will be getting an even bigger share of the Detroit vote this year than in 2008. On the Senate floor would be nice. This is an old post from the Hot Air Green Room, but it’s a pretty comprehensive list of Dirty Harry’s forays into crony capitalism, nepotism and graft. Like many, if not most, wealthy politicians, Reid never created anything – he just abused his office by skimming something off the top of everybody else’s endeavors. Morris Shenker, a mob attorney associated with the St. Louis Mafia, Meyer Lansky, Jimmy Hoffa and the Dunes Hotel. 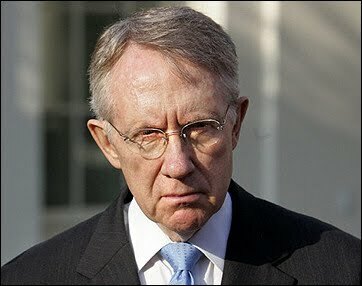 He funneled campaign money to Reid through his daughter Patty. 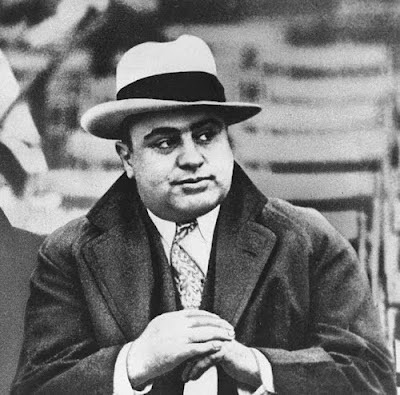 Moe Dalitz, associated with the Cleveland mob. He gave Reid $1,500. Irwin Molasky & Merv Adelson. These were Dalitz partners in the Rancho La Costa development. Molasky has given at least $15,000 to Read and Adelson have given at least $40,000 to either Reid, his leadership committee or the DSCC which Reid controls. Ed & Fred Doumani, associated with the Chicago Mob, gave at least $6,000 to Reid and the Democrat Senatorial Campaign Committee. Kirk Kerkorian, former owner of Caesar’s Palace, has Mob ties and gave over $100, 000 to Reid or DSCC. Steve Wynn, connected to the Genovese mafia family, gave Reid at least $19,000. Sam & Edgar Bronfman. Sam was a bootlegging associate of Meyer Lansky. Edgar is his son. Both have made substantial contributions to Reid. Joseph Alioto. Alioto is a San Francisco politician related to Milwaukee Mafia boss John Alioto and was implicated in the Koreagate bribe scandal. He and his wife gave $5,000 to Reid. Update II Mitt Romney responds to accusations made by Senator Harry Reid (D-Bag). "And I can hit almost as well as I pitch"
I don't get it. Is this supposed to be some kind of Salvador-Dali-like attempt at surrealism? If so, where's the floppy national debt clock? Anyhow, it looks like caption time, to me. ...how come I know about it? I'm not saying it's a bad idea; I just hope this isn't another one of those politically-motivated leaks (the same way, whenever I watch Old Yeller, I keep hoping the dog doesn't die). Sally Zelikovsky urges a vigorous intellectual response to the outrages of the tolerance gang. So, from now on, don't play the politically correct game. Throw it right back at them. It's violent, offensive, repulsive, intrusive, racist, bigoted, intolerant, or divisive. It sets a bad example for the young, it violates our rights, and it threatens not only a civil society, but a free society as well. And don't back down or cower because of this thuggish behavior. This is a time for valor, a time for all of us to take a stand. Our soldiers do not cringe in the face of danger just because the enemy has a gun. Neither should we. How about owner of a Dog-Fil-A franchise? Like Smitty, the author of the post linked above, I will be stopping by Chick-Fil-A this evening for a couple of chicken sandwiches, some waffle fries, and two of their delicious milkshakes (strawberry for Mrs. Paco, chocolate for me). Now, if only Five Guys will endorse Romney, I’ll have an excuse to eat there more often, too - for the good of the country. Update: Whoa! Due to this being Chick-Fil-A Appreciation Day, there was a line of cars a block long waiting to pull into the restaurant near my house, and it was impossible for me to get in. Bad news for me - I have to put off my chicken sandwich until tomorrow - but good news for Chick-Fil-A. And maybe good news for Romney. The people who made a point of showing up today may well be an indication of the growing strength of anti-liberal sentiment in Northern Virginia. Harry Reid slanders again, this time with a lame, unsourced rumor about Romney (I would have said that Reid just pulled this out of his a$$, except that would probably be something of a tautology). 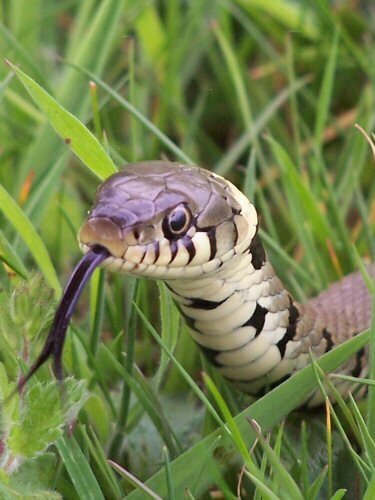 What a snake in the grass. "I think you owe me an apology, buster!"